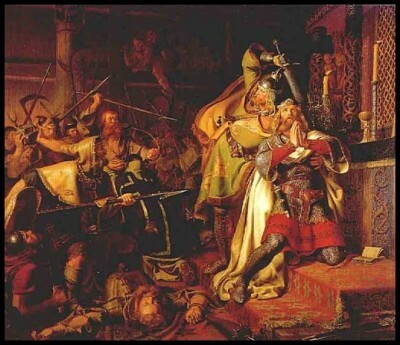 St Canute IV, was the illegitimate son of Swein Estrithson, nephew of King Canute the Great. Both were great in diferent ways. St Canute is to be distinguished form his probably more famous grand-uncle, Canute the Great (c. 990- 1035), who was King of England, as well as Norway and Denmark. St Canute was his grand-nephew who favoured the Church, but was put to death by a disaffected faction led by his brother. 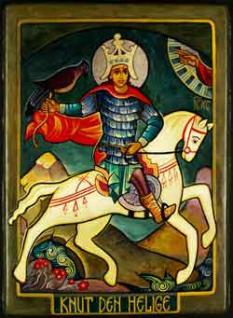 He is venerated as a martyr. Patrick Duffy tells what is known about him. It is of his granduncle that the story is told that he set his throne by the seaside and commanded the tide to halt and not wet his robes. But it is disputed whether this was something that came as a shock to his pride or whether he himself set it up to counteract the growing myth of his own omnipotence. Our saint, known as Canute IV, was the illegitimate son of Swein Estrithson, nephew of King Canute the Great, and he himself became king of Denmark in succession to his brother Harold in 1080. He married Adela, daughter of Robert I, Count of Flanders and they had one son, Charles. By this time, Denmark had become at least nominally Christian, having been evangelised from England. Canute made laws protecting the clergy and exacting tithes for their upkeep. He also built and endowed churches. Although William the Conqueror had established himself in England, some of the Danish earls there rebelled against him and asked Denmark to come to their aid. Twice, once in 1075 and again 1085, Canute prepared to assert a claim to the English throne. Neither attempt was successful. The first was a raid on York which was beaten back. The second caused William enough anxiety to institute the Domesday Survey or census. But Canute never set sail. The forced collection of tithes for the Church in Denmark aroused resentment and Canute’s brother Olaf, who also wanted to be commander of the fleet, became the leader of a rebellious faction against him. Canute was forced to flee and take refuge in the Church of St Alban at Odensee on the isle of Funen. But there, he, his brother Benedict, and seventeen companions were put to death. A cult arose and miracles were attributed to him. An English monk Aelnoth of Canterbury, wrote his life and Pope Paschal II approved Canute’s cult in 1101. St Canute is regarded as the patron of Denmark.